China is no longer accepting American recyclables. That’s caused the market for them to crash, dramatically increasing costs for municipal recycling programs in Michigan and the United States. Shortly after taking office in 2007, Westland Mayor Bill Wild launched “Mission: Green,” a program to slash carbon emissions, limit stormwater runoff and improve quality of life in the Detroit suburb. A cornerstone of the plan: Introducing single-stream, curbside recycling to Westland’s 82,000 residents. It was a success, touting a 78 percent participation rate and diverting more than 80 million pounds of trash from landfills in eight years. Last month, the city decided to reroute recyclables to the garbage heap after the company that processed Westland’s materials — ReCommunity of New Boston — more than quadrupled its rates, which would have cost the city more than $300,000 extra each year. Westland, Michigan’s 11th largest city, is among local governments nationwide struggling to pay for recycling after China last year halted imports of recyclables, triggering a global plunge in prices for paper, plastics and other materials. “It’s a global problem, it’s a state of Michigan problem, it’s a local problem,” Wild, who recently sold an auto recycling business his family had operated for decades, told Bridge Magazine. 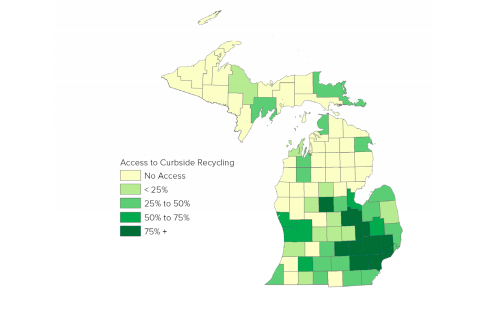 Cities nationwide have canceled recycling programs, and more could follow in Michigan. Toronto-based GFL Environmental, the largest waste hauler in Southeast Michigan with contracts in 65 communities across the state, recently sent letters telling local governments they’d need to pay significantly more to continue recycling services. The market turmoil comes after years of efforts to improve recycling in Michigan, which is home to cheap landfills and recycles 15 percent of its waste. That’s the lowest in the Great Lakes region and well below the national average of nearly 35 percent, according to the U.S. Environmental Protection Agency. On his way out of office late last year, former Michigan Gov. Rick Snyder cut a budget deal to give local recycling efforts another $15 million a year. But those efforts may be offset by global economic pressures. Some communities are suffering more than others. Those that belong to regional recycling efforts or have longer-term contracts can weather the storm, but those on short-term contracts are at the mercy of private recyclers, said Mike Garfield, executive director of the Ann Arbor-based Ecology Center, a nonprofit that has advised communities on recycling plans. That’s what’s happening in Westland, which had paid $18 per ton to truck the city’s recyclables 15 miles south to ReCommunity’s facility in New Boston. The company was recently purchased by waste juggernaut Republic Services, which makes more profit by hauling trash to landfills and did not respond to messages from Bridge. In February, Wild learned company was increasing Westland’s prices to $80 per ton on its month-to-month contract. That would cost the city at least $310,000 more per year, eating into the city’s $65 million budget. Westland Mayor Bill Wild says he hopes residents continue separating their trash, even though soaring prices mean all recyclables now go to landfills. Wild initially proposed sending Westland’s recyclables to a Detroit incinerator — operated by Detroit Renewable Power — that has a long track record of pollution violations and complaints about terrible smells. The Westland City Council rejected that contract after loud opposition from folks in Westland and Detroit, including U.S. Rep. Rashida Tlaib, D-Detroit. For now, Westland will send recyclables to a landfill at a cost of $28 per ton. But as the city negotiates with ReCommunity and searches for less expensive options, Wild still wants residents to continue filling recycling bins, even though their contents are going to landfills. In the recycling world, 2018 was the year of the sword. Once a huge buyer of recyclable scrap from the U.S., China last year banned imports of 24 types of solid waste and adopted strict limits for contamination in other materials it accepts from overseas. China’s “National Sword” policy addressed concerns that too many tainted materials originally labeled as recyclables had piled up in Chinese landfills and harmed the environment. China’s exit from the global market created a glut of commonly recycled materials like mixed papers and plastics, slashing their worth and giving local governments a crash course in waste stream economics. “We're working with these communities — our customers — to try to make sure that we keep curbside recycling as a viable option,” said Munem, the spokesman for GFL Environmental waste hauler, which contracts with Republic Services to process recycling. But maintaining municipal recycling can only happen by increasing fees “just to get to where we’re not hemorrhaging money,” Munem said. Experts say the policy change highlights the problem of contamination – mixing garbage into recycling, which slows processing facilities and damages equipment. “As soon as [residents] chuck in the open container of Tide detergent that still has detergent in it — and that leaks over everything else, everything else becomes garbage,” Munem said. China’s sword hasn’t cut all local governments in Michigan equally. Some are bleeding less, including Emmet County, which has become a regional recycling hub in northern Michigan. The market plunge means the county is earning about 20 percent less from its recycling sales, according to county figures. But the county also owns a waste transfer station, and fees it collects from haulers help offset losses, said Andi Shepherd, director of Emmet County’s recycling program. Additionally, Emmet’s operates a dual stream recycling program, meaning residents themselves separate paper fibers from containers. That cuts down on labor and yields cleaner materials that are easier to sell, Shepherd said. Emmet County and other community operators of recycling facilities are better equipped to handle the changing market because they could sock away earnings when prices for recyclables were higher, said Garfield of the Ecology Center. In southern Oakland County, the regional corporation SOCCRA recently installed a new recycling facility and offset rising costs by processing and selling materials from outside its 12 member communities. Prices have fallen for many items, but the agency still has buyers for its recyclables and is in discussions with corporations and communities about expanding services, said general manager Jeff McKeen. “I wouldn’t call it a crisis,” said McKeen, whose group represents cities including Berkley, Birmingham, Royal Oak and Troy with a combined population of 283,000. Whatever it’s called, the plunging prices have leaders of other communities considering banding together. 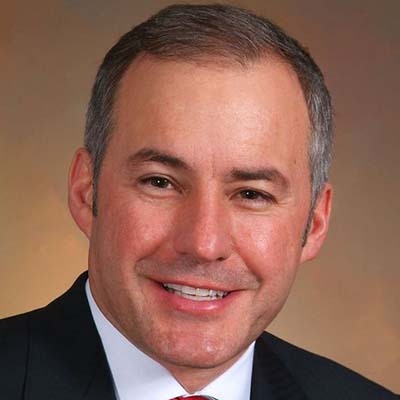 The Conference of Western Wayne, which represents 18 communities in Wayne County and 700,000 residents, recently launched a task force to consider options including operating a recycling facility, Wild said. 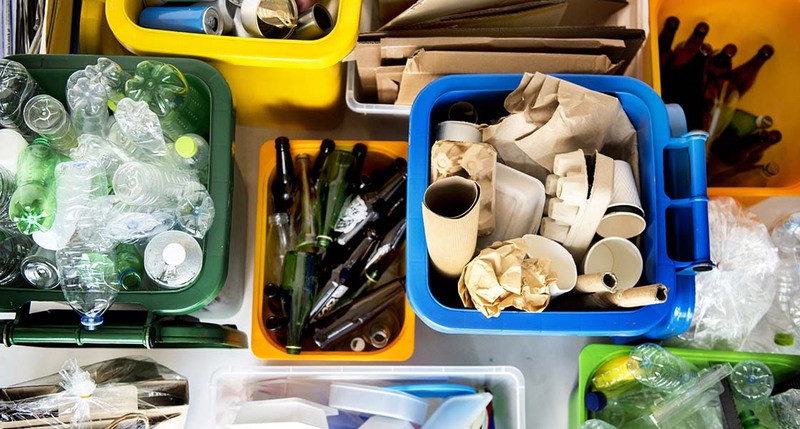 In nearly Washtenaw County, leaders of communities including Ann Arbor, Dexter and Saline are considering forming a similar group to handle recycling, MLive reported this month. I'm wondering if recycling that happens as a result of Michigan's Bottle Bill is included in these metrics or if the writer only addressed recycling through municipal systems? After a recent visit to my sister's place in Massachusetts, I noticed that at least half of the difference in recycling volume between our two households was due to the "returnables" that are separated from other recyclables at my home. Certainly the collection and sorting at retailers of aluminum cans, uniform types of plastic bottles and reusable or easy-to-recycle glass bottles should provide a higher-value waste stream than what is typically collected by waste haulers from either homes or businesses. There are a couple of things that it is clear that folks in the US need to do. The first is to put hefty taxes on containers of all sorts that are not made of recycled or compostable materials. This will help to build a market for recycled materials. Both these comments are right on target. But with our present GOP controlled legislature nothing meaningful will happen. The soda can refund has worked very well. But the GOP hates that because that means businesses have to pay for the problems they create which Republicans see as 'unfair' and 'anti-business' so we don't have a refund for the gazillions of plastic water bottles that now litter our state (forever). I questioned years ago the move to 'single stream' and our township went ahead anyway after some absurd answers about how the various materials would get sorted out. This is the result. It wasn't all that hard to separate glass, metal and paper and we'd be way ahead at this point if we'd realized the single stream 'vision' was a joke. Rick-The bottle bill diverts much needed revenue away from Michigan's recycle bins. These beverage containers, made from aluminum, PET and Glass are returned to grocery stores, collected, processed (shredded or baled), and then sold. The revenue from the sale of the recycled containers goes back to the original distributor of the container (mostly pop and beer companies). 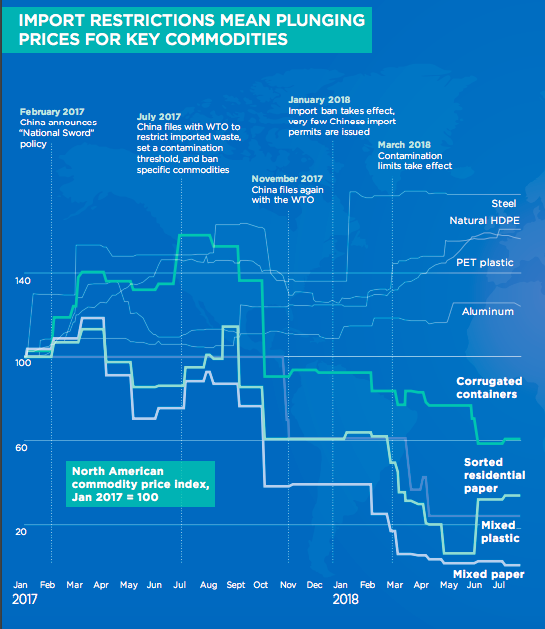 If you look at the chart included with this article, the prices for aluminum and PET have increased since 2017, while paper and mixed plastic have fallen. Cans and PET containers, along with steel cans, are the most valuable commodities in the recycle stream--and they simply are not present in Michigan's residential recycle bins. So, this means that the Revenue that Municipal Recycling Facilities (MRFs) get for their baled material is less than-- say a MRF in Ohio-- because our MRFs have a much greater percentage of low-value paper to sell than Ohio and other non-deposit states do. Therefore, when prices on these already low-value commodities fall even further...programs cannot afford to spend the $$ necessary to sort and process the material into a salable form. Also, someone asked if the 15% figure included the beer and soft drink containers collected by the bottle bill...I believe that it does. I work in this area, and that figure is consistent with what I know. Interesting angle on recycling. You should do a Recycling for Dummies article, I think the whole area is full of mis-information. Thank you. Actually Lisa, paper is the most valuable commodity. Especially if kept clean of the food and liquid waste and chemicals from containers. HDPE #2 natural milk jugs are the most valuable kind of plastic in Michigan. Lower volume though. PET #1 bottles are higher in volume, lower in price. The bottle bill.system has served Michigan well as an anti litter campaign since 1979. It is under threat by the lobbying grocers associations however. We would like to see a bottle deposit on single use water bottles to incentivize their recycling thru deposit system or disencentivize their use. Emmet County Recycling as quoted in the article is doing recycling right! With full transparency and willingness to help other recycling programs throughout the State. Hi, Lindsay--this doesn't jive with my experience...I am surprised to learn that paper is so valuable. Can you give me an idea of the prices that HDPE, PET and paper command per pound? If you were around at the time, returnable deposit bottles and curb side recycling were driven by the emotions of keeping sidewalks clean of cans, plastic, and such they were not about the business of recycling or the problems to overcome when recycling. The reality of recycling is similar to all other materials business, it is the removal of contaminates, and that is something in recycling that has gotten worse as the politicians have taken over driving it. Early in the curbside recycling there was a degree of screening by the guys doing the pickup, they would leave a note with the plastics of paper about why it wouldn't be taken, but that upset the residents so the local politicians [along with China's willingness to accept a lower standard of recycle] put pressure on changing recycling standards. If you want a return to recycling we need to address the problems of recycling starting with the end user to see what they can accept and still stay in business and work up the chain of recycle addressing each along the way. And if you want to blame a Party start with the Democrats who pushed to end the use of paper cups and containers, such as those at fast food places, we had to save the trees before they could look past that to realize trees are renewable. I agree Paul...when a new company takes over they are often not accepting the same items. More information on what is accepted and reminding people they must rinse items before putting in the recycle bin would be helpful. I'm amazed at the number of people who still refuse to recycle. Unfortunately the fact is most recycling is is just an exercise in feel- goodism, (which I participate), costing more in money and pollution that is reduced. Sure we can tax stuff to make it more competitive but that's just another consumption tax that those on the left despise. On the other hand dumping it in a landfill does accomplish carbon sequestration! If our MDEQ would not be the strong arm in fees and "violations" that are outrageous, companies would be able to keep costs down for recycling. The MDEQ are nothing but book readers without experience. Glass is no longer being recycled in our area. I am considering purchasing a glass crusher. I searched on the internet and it seems crushed glass makes an excellent fertilizer. Crushed glass can only be used as a mulch, not a fertilizer. We have done well with recycling but now as a population we need to change our thinking and start re-using. Make containers reusable, stop using plastics (difficult but baby steps), use glass containers, promote wood implements (toothbrushes, drink stirrers), replace plastic straws with paper straws. We as consumers need to support merchants and stores that support reusables. Another waste stream that can be greatly reduced is food waste. Backyard composting is advancing but available to only those with the space. Communities need to invest in curbside composting. All food products (yes, even meat), yard waste, and wrappers that are not plastic can be composted in a commercial composter. Initial investment would be hard to sell to the public but would solve our long term problem. Organic matter created easily used in city gardens, farm plots, and sold. Retailers would have to be convinced to use compost able boxes and utensils (McDonald’s in Seattle uses implements made of cornstarch. So let’s make the next steps to re-use and composting. I think we need to accept that China is not the problem. We as consumers need to reduce our waste stream. Nobody wants somebody else’s waste. It can be done if we have the political will. We could lead by example. Why is it impossible to recycle #5 and #7 plastics - can't we get the dairies and yogurt makers to opt for types #1 or #2? Why is styrofoam still a thing -- impossible to recycle, a space hog in the landfills. Someone really should address this with Dart, a Michigan company, and tell them if they are going to make and sell a type of material, having a responsible method of disposing of it is the other side of the coin. Why is it so difficult to find the recycling code on most packaging? It should be imprinted large and loud to encourage recycling. Why are there no longer any PSAs to instruct people how and why to recycle? (I know, I know, it's Reagan's fault.) To make recycling a functioning system, we need buy-in from all parties -- the container manufacturers, the trash haulers, and the public, though they are the worst. You really have to make it a no-brainer for some people. In my complex, there is a single-source dumpster with large words on the side "NO PLASTIC BAGS" and what is it full of? Plastic bags (#4) and oily pizza boxes. I salute the big box stores that collect plastic bags. I seek out recyclable and biodegradeable products (just found some nifty drink straws made from corn that decompose in six months!) This is a battle worth fighting. In fact, you'd think some smart person would recognize the business opportunity, just waiting for development and easily scalable to a national, even global level, and jump on it to (sorry) clean up.